IT'S A QUEERNESS & WELLNESS RETREAT, DAHLING! 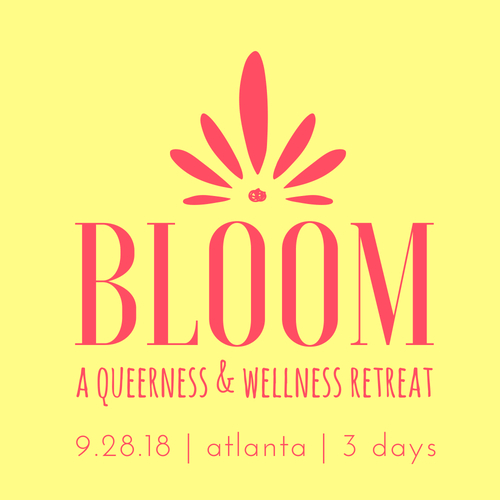 BLOOM is a Queerness & Wellness Retreat that focuses on authentic-living and building community through power vinyasa, aerial yoga, daily mindfulness meditations, plant-based community meals, group discussions, free movement, dance and ritual. PJB, Melissa Coffey & MILKVINE connect vibrations to curate a weekend camping experience for queer humans and allies of all shapes, sizes, colors, abilities and identities at a private farm just east of Atlanta. The property is a lush and tranquil gay-owned farm, located in Lithonia, Georgia - a 30-minute drive from Downtown Atlanta. The 10-acre property dates back to the 1790s and includes a Victorian farmhouse, a three-level community gathering barn, beautiful gardens, a pond and historic structures. Questions? We've got ALL the answers, hunny! Click here to access the FAQ! COME AS YOU ARE & BE CELEBRATED! local & regional product and experience sponsors, stay tuned! SPILL IT, GURL, SPILL IT! Check out our two full-ride & $150 scholarships available! Yoga? Aerial Yoga? Community? Relaxation? Meditation? Anything goes!